People ages 15-40 suffer from the most ganglion cysts and women are the most commonly effected. Ganglion cysts usually pose no health issues and are best left alone. 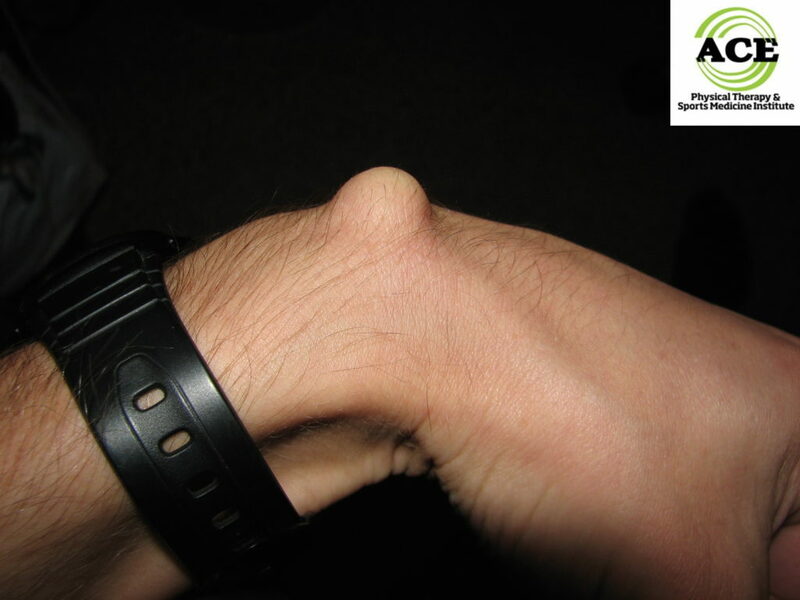 Don’t try to “smash” a ganglion cyst because damage to nearby structures can occur. A physical therapist can help to help with your recovery if you have a ganglion cyst. Ganglion cysts are commonly occurring, non- cancerous “lumps” that can form anywhere in the body but usually on the back of the wrist. The lump is usually harmless and does not cause any health issues. Causes of ganglion cysts are usually not known and do not dictate the treatment. If a ganglion cyst causes pain or limits motion, there are a variety of treatment options. The ganglion cyst will develop in a tendon sheath or in a joint. The cyst is similar to a water balloon on a stem and is filled with a viscus fluid similar to the synovial fluid that lubricates the joints. In some instances, the cyst can be large enough to limit motion, and if it is presses on a nerve, it can also cause pain. In these situations, the cyst must be treated. Sometimes the standard RICE (Rest, Ice, Compression and Elevation) principles of acute injuries can reduce symptoms of pain and limited motion due to the ganglion cyst. If this doesn’t help, a doctor can examine and recommend treatment. Using a “wait and see” approach, the doctor might prescribe several physical therapy sessions. These treatments include the use of modalities, exercises and manual techniques that are designed to enhance blood flow and reduce inflammation around the cyst. There is no reason to be invasive if the cyst is not limiting function or causing pain. A patient may seek additional treatment if the cyst continues to cause pain, limit motion, or for cosmetic reasons. The doctor may treat the ganglion cyst through aspiration of the cyst and an injection of a corticosteroid. If the cyst persists or re-occurs, the decision might be made to perform surgery and remove it. The size of the stem and the extent of the surgical excision will determine how difficult the recovery period will be during the post op period. The surgeon removes the stem and sutures the site of the attachment to help to prevent a re-occurrence of the cyst. Physical therapy is usually started approximately one week after the surgery. This period of time enables the surgery site to “calm down”. When the pain and swelling are stable, the patient is ready to begin the therapy to restore function of the involved body part. The physical therapist will initiate a treatment plan that includes numerous exercises and activities that will restore motion and strength of the involved body part. The pain that is present when the area is moved is secondary to the surgical trauma of the soft tissue. Gradually restoring the motion and strength over several weeks will prevent the area from becoming inflamed and more painful. There is rarely damage to any structure that will limit function, but the general soft tissue trauma from surgery can be addressed with manual techniques and modalities.